The climb to the top of Mount Matebian is the toughest day walk I’ve ever attempted – lucky I didn’t know that when we started. The name of Timor’s second highest mountain means ‘Mountain of Souls’. It’s a sacred place where Timorese believe the spirits of their ancestors reside. Pip’s Tetun teacher warned her that terrible things might befall us if we ‘greeted’ any animals or pointed out the scenery. Sometimes Matebian is referred to as the Mountain of Death. Japanese forces, who occupied Timor during World War II, created a vast system of caves and tunnels in the area for their camps and arsenals, and killed many people there. The Indonesians did the same when the mountain became the stronghold of Falintil, the Timorese resistance movement. After the Indonesian invasion in 1975, around 20,000 Timorese took sanctuary on Matebian, among them the parents and grandfather of a workmate. Staying on the lowlands meant accepting Indonesian rule, he told me. But after three-and-a-half years, hunger forced his family down off the mountain. With this history in mind, we set out one weekend in October with Kiwi couple Paul and Liz Fitzmaurice, and Abrau, a Timorese student who I’ve met through teaching English. Click on the photo gallery below to find out more. 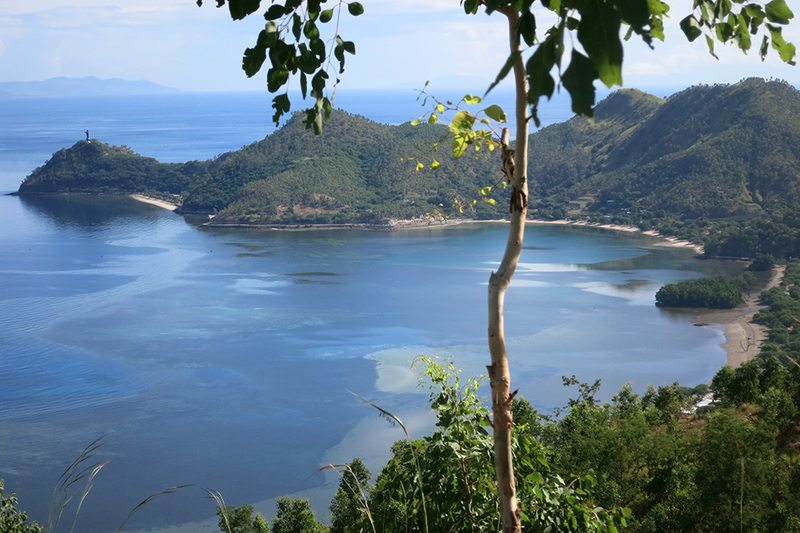 Leaving Dili on Friday afternoon, we head east along the coast from the town of Baucau. Mt Matebian looms inland, 2315 metres (7595 ft) high. The sun sets as we stop to look back from the foothills towards Baucau. With night falling, we drive two hours along an awful road to our guesthouse in Baguia, 50 km from Baucau. On Saturday morning, we’re up at 5am to catch the dawn. You can see why the country’s traditional name is Timor Lorosa’e which means Timor Sunrise. It takes another hour to drive 20km to the village of Oeiburu at the foot of Mount Matebian where we’ll leave our car. The village of Afaloeki lies nestled below Mount Matebian. Further on, the steep slope to Oeiburu proves too much for our car which gets stuck in loose gravel. Abrau and Liz provide ballast on the front right while the locals help push the car back on the road. At Oeiburu, we’re assigned two young guides for $10 each, plus $20 for the village to look after the car. The boys speak Makassae, a different dialect from the Tetun we’re learning in Dili. They dart ahead in jandals, chatting and occasionally breaking into song. They’ve got none of our flash walking gear, snacks, electrolyte solution or water bottles, though one has a pouch cut from a rice sack containing a catapault and knife. Our guides have a food supply after all. One scampers up a tree and throws down sour fruit almost as big as soccer balls, tasting somewhere between a grapefruit and an orange. Occasionally, they pick wild raspberries from beside the track. A lot of the track is out in the open through long grass and rocks. A few Timorese still live on the lower levels in thatched huts like the one on the right overlooking small vegetable gardens terraced with white stones down to the valleys beyond. About three-quarters of the way up Matebian is this humble altar where church services are held during frequent pilgrimages by the Timorese. After a long slog, we’re near the summit with the altar well below us. The last leg requires hauling ourselves up through a rocky escarpment. Our two guides are first to reach the statue of Cristu Rei, Christ the King, on the summit. It’s the start of the ‘hungry season’ and these boys probably only eat a couple of bowls of rice a day but they’ve scooted to the top like mountain goats. When given boiled eggs for lunch, their eyes light up as though it’s Christmas cake. Pip makes it to the summit. One small step for mankind, one giant step for her. Four intrepid Kiwis (Paul, Liz, Pip and me) enjoy the 360-degree views, including Timor’s south and north coast. On 2 November, All Souls Day, thousands of Timorese clamber on and around the mountain top, paying homage to their ancestors. Sir Ed and Sherpa Pip: If you were super-fit, you could make the climb in three hours or less, but we’re pretty happy with our 4 hours 10 minutes. Looking north to the coast from the top of Matebian: Although the wind’s cold, the sun’s hot with no mist or cloud to impede the spectacular views. Pip’s walking poles are a great source of mirth to the Timorese. For some reason the meadows near the summit prompt people to burst into songs from The Sound of Music. Looking back up to the summit, we can’t quite believe we were there. Cristu Rei’s a tiny dot just to the right of the central peak. We expect the descent to be easier but the grass and rubble are slippery and our legs turn to jelly. Nine hours later, we’re back at the start with a visit to Abrau’s family ahead of us. They’ve prepared a ‘snack’ of rice, two meat dishes, fried sweet potato and vegetables. There’s Strawberry Fanta for the girls, and a bottle of sweet red Portuguese wine for me and Paul. Abrau, who carried Liz and Pip’s day packs most of the way, does well bridging the language and culture divide. After eating, we leave him to spend a rare night with his family. Driving back to the guest house, we realise the car’s in trouble but are too tired to care. Next morning reveals a hole in the radiator. Our 64-year-old landlady gives us some of the precious water she and her two grand-daughters lugged from a tanker the night before, along with a jerry can she won’t let us pay for. Pip, Abrau and I hitch a ride on a truck to the nearest cell phone coverage. I send an SOS to the Baucau branch of World Vision, the organisation I work for. A local Red Cross worker invites us to sit on his shady verandah beneath a poster of a freedom fighter while we wait for help. His cigarettes are stashed in the rafters above the front door. His wife brings us sweet black coffee then breastfeeds her baby, the youngest of seven children. ‘Timor needs children because so many people were killed during the resistance,’ he says proudly. Two hours later, three World Vision workers arrive in a grunty 4WD to tow us back to Baucau. The rope breaks three times until it’s so short that Paul, steering the car, is almost sitting in our boot. We spend an unexpected night in the Melita guesthouse, enjoying ocean views and a delicious $5 dinner. Next day, World Vision arranges a truck to haul the car and a driver to take us back to Dili. We’re a day late getting back, tired, and very grateful.